For stunning container gardens, mix and match different kinds of succulents. The result can be just wonderful. You can sometimes buy these gardens ready-made at nurseries and garden centers. But it is fun to do it yourself. All sorts of containers are suitable for succulent gardens. It will need to have three or four drainage holes depending on the size of the pot. If necessary, drill these in the container you’ve chosen. One of the most beautiful succulent gardens I’ve ever seen was planted on a piece of driftwood. I’ve known people to use seashells as well. Whatever you choose, make sure it allows the potting soil to drain properly. For the best results choose containers that are large enough to hold a wide array of different plants. A regular cactus and succulent potting mix is fine. When I’m buying a new brand for the first time, I like to test it to be sure it is well drained. Otherwise, the plants can suffer from poor drainage and eventually succumb. When I’m shopping for the plants, I like to buy ones with different growth habits, shapes, kinds of foliage, and other features. For example, moss rose or portulaca planted around the rims of the pot is very beautiful when the stems trail over the edges. For visual interest, use a combination of trailing and upright plants. Examples are the red yucca and the shorter agaves. For a really gorgeous container, combine different species and cultivars of the same kind of plant. An example would be the many cultivars of house leeks (Sempervivum spp.). The foliage may all be in the form of a rosette. The texture from one cultivar or kind of houseleek can vary considerably as well. Ones with tighter rosettes have a softer texture, while ones with large, loosely arranged leaves are coarser looking. The foliage can also be richly colored. With all the new varieties and kinds available, it isn’t just green any more. The leaves can add other kinds of interest to a container. For example, some cultivars of Echeveria have frilly, puckered foliage. ‘Fractal’ is one of the most unusual. It features frilly leaves that resemble those of a flowering kale or cabbage. To get the best results, mix and match plants featuring various sizes of leaves. This helps to provide contrast to the container garden. 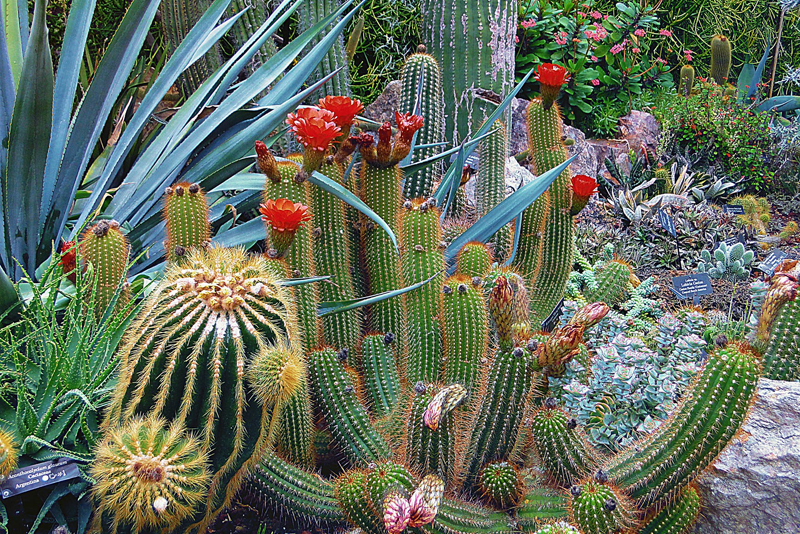 For color, explore the different kinds of suitable succulents with colorful foliage. There are cultivars of stonecrops or sedums featuring variegated, purplish, red, and yellowish leaves. Once my succulent container gardens are completed, I avoid placing saucers under the pots. Water or rain can collect in these, and cause damage to the plants. If you prefer to use saucers for aesthetic purposes, do empty them when water collects. Blossoms can add greatly to the beauty of container gardens. The flowers of succulents tend to be just outstanding. Yet a mixed container can be dull if we depend solely upon the blooms for visual interest. For that reason, focus on selecting species or kinds with lovely foliage or interesting growth habits.